In this artist-led one-day course, participants will learn the basics of 16mm projection and explore the mechanics of the machines, as well as experiment with the use of projectors as instruments and the possibility of performance as a live event. Please note for this workshop no prior experience of film technology or making is needed. 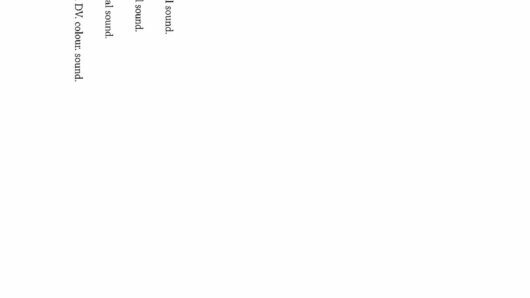 Professional Practice is a series of LUX talks, seminars and courses exploring practical issues for artists working with the moving image. Lynn Loo (b. 1975, Singapore) has been based in London since 2004. Loo earned her BFA from The School of the Art Institute of Chicago and an MA in Film Studies with Archiving from the University of East Anglia in England. Loo’s early films, which she began making in 1997, were semi-narratives—diaristic and poetic. They were shown in festivals, including Cinematexas, Women Make Waves Taiwan and Film Fest Dresden.After moving to England, and encountering works of expanded cinema for the first time, Loo began to make films that emphasize material qualities and investigate relationships in light, time and space between the making processes and the final live projection. Loo has been working with Guy Sherwin since 2005, adapting his earlier films into multi-projections. This led to both artists producing new works on which they collaborate. Loo and Sherwin have presented programs of live expanded cinema internationally in galleries and film festivals. 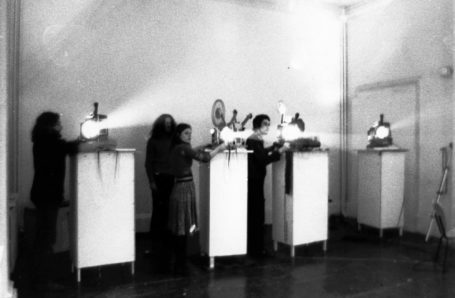 Filmaktion performance at Gallery House, London, March 1973. At the projectors: Malcolm Le Grice, Gill Eatherley, William Raban. Photograph by David Crosswaite.